(For this post, I owe a word of thanks to Andrew Beers – VP of Product Development at Tableau, for the raw data, and Mike Klaczynski – Data Analyst on the Tableau Public team, for showing me this method). At the Seattle Hacks/Hackers event last night, we built an interactive data dashboard that allows the reader to explore bridges in the state of Washington, where a bridge crossing the Skagit River recently collapsed into the water after being struck by a truck carrying an oversize load. What’s notable about this dashboard is that you can click on any of the 2,489 circles on the map and bring up an embedded Google satellite image of the bridge within the dashboard itself. I didn’t have to take a screen shot of each satellite image – that would be way too much fun. Instead, I used a little-known feature in Tableau Public – embedded web pages (similar to the Embedding YouTube post from a few weeks ago). 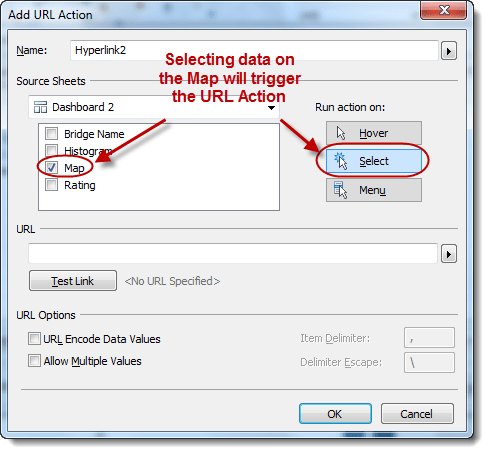 The first group of 5 steps shows you how to create a url for each bridge, and the second group of 5 steps shows you how to add a box to your dashboard to pull up the bridges. The next group of steps walks you through how to add a box to your dashboard that pulls up this embedded satellite image when a user clicks on a particular circle. 5. That’s it! Test it out by clicking on the map circles and see the satellite image change accordingly. I can see this being useful for organizations that would like to include images of office locations or real estate assets in their dashboards. For data journalists, it’s about allowing readers to interact with the abstract and the real in the same graphic. If you make a dashboard with a dynamic Google map, be sure to post the link in the comments field for all to see. Very helpful viz! I was there at the event. I came into work this weekend and was able to pull together a viz using these concepts. I had to do it in Tableau 7.0 since the server my employer uses is not yet at 8.0. I’ll post a Tableau Public link to the viz after I review it make sure the data is publicly available. Question: Under “Describe field,” there is an option to “Load.” It brings in the domain of the column. My lat./long are already in my data and don’t need to be generated. It seems like the range could be easily determined and calculable by Tableau. I checked your viz and there is not “Load” button nor is the domain listed. What’s the purpose of the “Load”? Hi Phillip – nice meeting you last week, and thanks for commenting! Looking forward to seeing your work. As for your question – I’m not sure where you’re seeing “Describe field” and “Load”. Can you give me a little more info about what you’re trying to do? If my Question didnt reach you, below are the one. 1) How to fetch data from twitter into tableau. 3) How to customize charts which are not available in tableau. for ex : gauge chart or organization chart which are out of box. Other tools have SDK, through which a new type can be imported. What about tableau ? Hi Hari – I answered your questions in the comment thread for the Boston Predictive Analytics group. Let me know if my reply answers your questions. I had to remove some data and sanitize it a bit, hence the jane and john doe names. I’ll follow up in a different comment re the “Load” question. Hi, Ben. I can’t paste images so will paste what Tableau copies to the clipboard. I can send images to you if the clipboard text doesn’t provide enough context or detail. The domain for this field has not been loaded. Click “Load” to retrieve. Hey Phillip – why don’t you send the images over via email using the email address in my “About” page (link at the top-right). Thanks, nice use of embedded satellite images by the way! You’re welcome Ramesh. Thanks for leaving a comment! Thanks for these instructions, it’s really helpful! One question, how did you make the Google Map show a marker of the coordinates? I was able to embed Google Maps, but could not show where exactly on the map. I would appreciate your help! I was able to connect the tableau maps to google maps through the instrcutions you have given, but i am not able to hide the panel on the left on Google maps website in Tableau where they give things like “Directions”, “search nearby” and all that. I have another question too, How to find directions in Google maps from one standard place to the place that we click on Tableau map? I saw a sample workbook which did that, but i could not figure out how to do it, would really appreciate the help, thanks in advance! &output=embed where “Address to Map” is the destination address that you pull from your spreadsheet and “saddr” is the starting address, which in this case is fixed to a specific location, but could also be dynamically linked to a data field. your method works fine, but whenever i click on the area which i want to see on google maps, it gives an error called “An error has occured in the script on this page”, but the maps are showing fine. Hence i want to hide this error. What do i do for this? Hi Sandhya, I’ve seen that same error before, but I’m not quite sure what to do to get rid of it. Have you had any luck yet? Take a look at this link. It seems to have solved the error for my students. Is there a tutorial on how to draw polygons onto the embedded webpage? Right now I got the webpage to zoom into the location of wherever I click on the map. The next thing I want is to draw the polygons I have on the map onto the webpage. Marco, if you want to draw polygons on a map, you can draw them on the standard Tableau maps (online kb article here). I don’t know of any way of drawing them on an embedded web page like Google Maps. Just trying to replicate the above but after creating the blank space then going into dashboard -> action -> add action, the map option does not come up. Hence I can not make the maps interactive. I’m using the latest version 8.1. 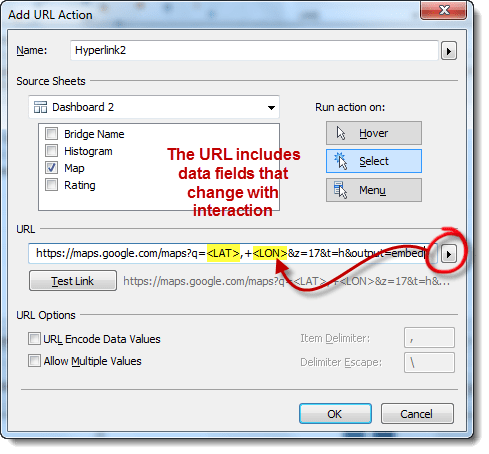 Hi Teresa, are you adding a URL action and inputting the map URL with your Latitude and Longitude fields? It might help to email me a screen shot of your Dashboard Action, as I can’t quite make out from your description what’s going on. See my About page for email info. Is this a change that google maps has made? I am on the latest version of Tableau, 8.1. I did this post and it had a great result. The thing is that now Google Maps has changed and when i do the embed on Tableau it asks me to call it as an iframe. Do you know how to fix this? Thanks for posting! When I use this method a message pops up that says: “The Google Maps Embed API must be used in an iframe.” on the URL page in the dashboard. Any ideas to fix this? Hi Katie, yep, you’re right. Looks like recent changes in the Google Maps service has caused in this error. There are two ways to fix it. 1) simply change “&output=embed” to “&output=svembed” (Thanks Jeff Shaffer!). OR, change everything over to the Staticmaps format which is documented here. Does anyone else get an error saying: The Google Maps Embed API must be used in an iframe. Hi Ben – I know you have mentioned this already about iFrame error. But just as to update, even after changing from “&output=embed” to “&output=svembed”, iframe would not go. Only way is the hard way to use static URL documentation. If you can update your dashboard with output=svembed and repost, it would help all of us. Excellent tutorial. Many thanks, but now I’m trying to do something forward. If I select more than one point, do you know how to zoom this two points? I am having problem in the map; whenever I select a location it does not reflect in the google map. I just got a solution for the previous mentioned issue. Thanks. I have another question, how can I change the symbol of the pins (from dots to an image). Is that possible in Tableau maps? Fantastic tutorial. Have you had any experience with enabling search by address or lat/long in the embedded Google map (or elsewhere on the Tableau map)? That way the user could compare an inputted location to mapped locations already in the Tableau dataset. Not sure if that is possible, but I figured you would be the best user to ask. I’m using Tableau 8.2. Hi Chelsea, thanks for the kind words. I’ve never tried what you’re talking about, but agree it would be great to be able to input an address on a dashboard. It looks like embedded Google Maps has something called Search mode. Perhaps that is a good place to start. Love the tech behind this, but also wondering where did you get the bridge data for this project? Hi Ben – Can this be done in tableau server too. I mean once done on desktop, can this be published to tableau server ? Note that our tableau server do not have Internet connection but has intranet. So will the google maps work in that case. It works without any API / key / Staircamp etc. Hi Ben. Great post and happy to find your website when researching this topic. I was wondering if you need to have the map necessary to get to the street view. For example, my dashboard would have commercial building information and i have the lat and long based on the addresss. Would I be able to bring the street view based on location name selection, Like the rest of the elements in my dashboard, without including a map? Hi Ben. I found your great post around this topic and I was wondering if you have any updates from Tableau around this error “The Google Maps Embed API must be used in an iframe.”, even after using the most updated url here. I actually tried few other Url options with Google Maps, same error. Pingback: Detailed Geo Viz with Tableau, Mapbox and Google Street View | Data Science Riot! Awesome, thanks Jag! Yeah, this is a moving target for sure, as Google continues to make changes to the Maps service. Thanks for posting the update for everyone else to see.